The rolling hills and wheat fields covered in a layer of white, the drive from Spokane to Pullman is as beautiful as it is peaceful. Just 90 minutes from Spokane, Washington State University and University of Idaho dominate the landscape of this twin town of 50,000. With college enrollment of 18,000 at WSU and 11,000 at UofI, this is a region defined by young aspiring students. Conversations of Snookie and Coors Light are more likely to be found than sips of Sauvignon Blanc and Cabernet. On this journey we explore the wineries of the Palouse. 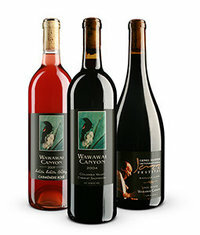 Merry Cellars has been making hand crafted wine from premium Washington vineyards since 2004. On our visit, Merry Cellars was celebrating their annual barrel tasting of three 2009 vintages. Winemaker Patrick Merry graciously welcomed us and beamed with pride as he showed us around their new tasting room just north of Pullman off of Highway 27 in an industrial park loop. The 2009 Tempranillo, Syrah, and Carmenere all showed promise in their youthful state. Each of these wines is expected to be released in the next few months. The stand out wine to me was the Syrah which already boasted a nice balance of fruit, spice, and flavor. As we tasted through each of the current 9 releases, the common thread of a hint of sweetness accented each of the fruit forward wines. A consistent quality was present across the board and only the Stillwater Creek 06 Syrah flirted with the $30 price point. On the Moscow / Pullman Highway is an eclectic artistic winery that breaks the mold of traditional expectations. While difficult to pronounce, Wawawai (three WA’s and an i) is named after the nearby canyon where the Moffett family grows Cabernet Sauvignon, Cabernet Franc, Syrah, Lemberger, Sauvingon Blanc and Rkatsiteli. The most recent plantings are classic Bordeaux blenders that contribute to the significant depth and complexity found in wines; Petit Verdot, Malbec and Carmènere. We spent a good hour talking to senior winemaker Ben Moffett. I was struck by his reserved demeanor and quiet passion for his unique wines. These are not your traditional fruit forward wines found in most wineries. Making only about 1000 cases per year, these wines had complexity and layers that are highlighted by earth, minerality, and terroir. The experience is highlighted by the modern art vibe of the tasting room. On warmer days, I would imagine that the adjoining barn would be a fun space for events and concerts. The experience on the Palouse was punctuated by three amazing meals. The irony in the dinner meals was the absence of local wine (and even Washington wine), but the locations, food and atmosphere helped soften that disappointment. How ironic for me, the writer for Nectar Wine Blog and owner of the new Nectar Tasting Room to be eating at a Nectar Wine Bar in Moscow. To be honest, prior to this trip, I had no idea that this business existed. After a humorous exchange of my business card with the hostess, we were seated in the cozy warmth of this Moscow hot spot. I enjoyed a flight of Zinfandel wine with my steak. The food was beautifully prepared and the potato / veggie side was seasoned to perfection. Others in the group were equally impressed with their experience. 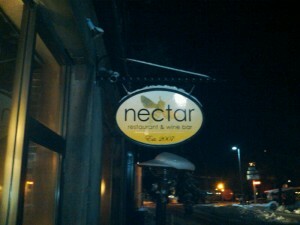 Part pub, part café, part upscale restaurant, this hot spot in the heart of downtown Pullman was quiet on our arrival. Our trip was during Apple Cup weekend, the annual rivalry with University of Washington. We enjoyed dinner as the staff kept tabs on the close football game. Ultimately the WSU Cougars lost but dinner was a huge win. As the game ended, downtown Pullman came alive with a rush of crimson (and even some hints of the enemy purple). As part of our night cap we enjoyed the eclectic atmosphere of Rico’s at 200 E Main Street in Pullman (walking distance from Swilly’s). Rico’s doesn’t feel like a small town bar. This is a large pub reminiscent of a Manhattan hot spot or Boston pub. While many of the patrons were drowning their sorrow in suds, the pace picked up steadily as the night progressed. With a large wood bar, old brick, and a wall of library books, this is THE spot to drink. The only fault I could find was the situation of the restrooms. One lady in our group mistook the quietly labeled upstairs men’s restroom as a unisex room and boldly shared the space with the guy at the urinal. I think he was more surprised than she was. Only later did she discover that the women’s room was downstairs. Before ending our weekend we were sent off with one of the most memorable breakfast experiences I’ve had. In downtown Moscow, dozens of people packed the inside of The Breakfast Club and even spilled out into the streets as they waited for their table on this chilly winter morning. The wait…totally worth it. The French Toast Benedict (bacon, cheese, eggs, and hollandaise sauce) and hash browns declared victory over my stomach as I satisfactorily retreated in defeat. The Palouse is perfect for an overnight stay even if you aren’t attending one of the major universities. I enjoyed the trip and was pleasantly surprised by the wine and culinary experience. I’m looking forward to the next visit. There is definitely more to this region than collegiate conversations of Snookie and Jersey Shore. Drop off your aspiring students and stay for the wine, food, beer and more. Thanks for the visit to the Palouse and the positive review of our 2009 Walla Walla Carmenere Rose! If you’re down our way again, stop in, we have a 2007 Walla Walla Carmenere that is garnering lots of positive attention, as well as an upcoming Carmenere/Cab/Malbec blend.